Oh Kelley, how could you? How could you introduce me to an amazing character like Maya, create such a great story complete with mystery, danger and wildlife, give me a taste and then hang me over a cliff? What’s next? Are you going to give me the world’s best chocolate cheesecake, let me lick the fork and tell me that I have to wait A FREAKING YEAR before I can have more? Gets up and checks other ARCS that are for the giveaway. Face plant flop on the bed where I stay for an hour. Kelley’s my favorite author. Never once have I read one of her books and thought, “Meh, that was kinda ok.” I’ve loved everything she’s ever written and The Gathering is no different as you can tell from my above spazz out. I’m such a dork that anytime there was a reference to Kelley’s Darkest Power Trilogy or her Women of the Otherworld series, I couldn’t help but stab at the page with my finger and giggle like a twit. At the same time I love that this could be the first Armstrong that you pick up and you wouldn’t be lost. I’m not really sure what else to say about The Gathering without just gushing some more. As always the writing was tight and solid and the storyline was amazing. In true Kelley fashion there were more questions than answers. But,I’m sure that those questions will be answered in the next two books. Now to patiently wait out the year until the next one is released. My name is Lee Mets (honest), and this is my book I’m part of the writing club, which is fantastic, since what I want to be most is a writer. My mother says that girls don’t grow up to be writers, they can only be nurses or teachers. But it’s the 1960s, not the 50s or 40s, and I think she may be wrong. Mrs. Gowdy, who is my writing teacher, says that I have a gift. I’m going to use it to tell you the story of my summer. It was a summer that was both wonderful and terribly sad. The sad part is still painful for me to write about, but I will because that’s what writers do. My summer began with the most exciting thing that ever happened on our street. A real-life orphan, by the name of Cassandra Jovanovich, moved in right across from my house. All the best stories are about orphans, and because of Cassandra, this story is no exception. Because of her, I got to write a play, and she starred in it. Because of her, I now know that being an orphan is not exciting, in fact it is the opposite. But you’ll have to read my story to find out why. From Second Story Press website. 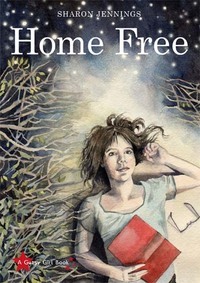 I normally hate describing books as “cute”, but that’s exactly what Home Free is: a cute book. But underneath the cuteness of the narrator’s voice is a more serious tone. There are some major issues tackled in Home Free. And it’s the way that these issues are presented that make this a book that I think all kids should read. I HATE kids’ books that have a clear moral agenda to them and the reader is hit over the head with it every single page. Kids are smart. They know when they are being preached at. But Jennings doesn’t do that at all. Yes, there are morals and yes, there are messages about how to act, how to treat each other, but they are woven so expertly into Lee’s story that they weren’t suffocating or obnoxious. I loved that the whole book was presented as a project for a school writing club. Lee is a very opinionated character and as a result she has a very strong voice. And the best part? Never once did I feel like I was reading what an adult thinks a kid should sound like. A lot happens in Lee’s life and each event teaches her sometime about life, but like I said, it wasn’t preachy by any means. What she learns is very organic to her story and never sticks out like an after school special or anything. I wasn’t sure at first if I was going to like Home Free, but I ended up really enjoying it. Mark’s Asperger’s Syndrome makes things hard for him at school. Mark’s mom and dad think MORE school is the answer. They can’t be right–can they? When they enroll Mark in the new taekwondo school nearby, he finds that his class is filled with adults–and four kids from his school he’s never met before. So now he’s got to meet new people (ugh), learn MORE new skills (ack), and oh yeah…somewhere in there, he’s got to figure out how not to flunk English. This was my first foray into young readers short fiction. Lydia is one of my favorite peeps on twitter, so when she approached me to review the story I read the blurb and thought that it sounded great. I really, really liked this little story. Not only was it well written and cute, I think it will be an excellent teaching tool for kids with Asperger’s Sydrome and also for kids who don’t have Asperger’s but know someone who does. Lydia does a great job of showing, not telling. The reader is exposed to some traits of Asperger’s without being hit over the head with it. And I think this is so unbelievably important for the young age group the story is geared towards. Children will learn about Asperger’s in Ready! but probably won’t even realize it at first. The story also does a great job of demystifingy the syndrome and will make kids realize that children with Asperger’s have all the same fears, likes and concerns as they do. I loved Mark. I just wanted to jump through the pages and give him a big ole hug. For such a short story he was a well-written and developed character. Ready! 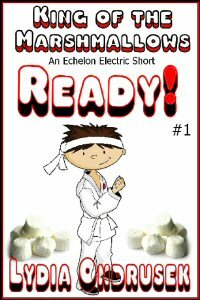 is the first in the King of the Marshmallows short story series. The next story is out in April. And you can bet your bippy I’ll be reading and recommending it. Tags: Apserger's Sydrome, King of the Marshmallows, Ready! From Simon and Schuster Canada website. Sigh. Can I just say “Go buy this book now because it’s awesome” and leave it at that? Really. Because Wither was the perfect balance of all things dystopia: despair, mystery, hopefulness and romance. And it made this book geek very, very happy. The story pretty much caught my attention from the get go. Before I read Wither I heard it describe as The Handmaid’s Tale for teen and I can totally see the comparisons. But for me this book was definitely in no way a rip off or copy. It was wonderful and unique and I loved it for what it was: a damn good YA dystopia. I think one of the things I enjoyed the most was watching the relationship between Rhine and her sister wives develop. They were all very different and had different takes on being married to Linden and it was interesting to see them interact with one another and develop a relationship. It was far from the perfect situation for any of them, but they each did their best to not only survive, but to make the situation the best that they could. Another aspect that I thought was BRILLIANT (yes it warrants the caps, IMO) was that despite the fact that Rhine is such a strong character and from the get-go she is Hell bent to escape, the more she gets to know her husband and the longer she’s in the marriage, the more she starts to have moments of “Hey, this isn’t so bad”. In other dystopias I’ve read the heroine is either content and slowly starts to realize things aren’t what they seem, or she fights against the Big Bosses and the way things are from the beginning. It was very nice to have a heroine that was pretty sure she wanted to escape, but had moments of doubt. This was definitely a character driven dystopia and wasn’t filled with constant action and danger. It was a quiet book, which was perfect for the plot and the characters. 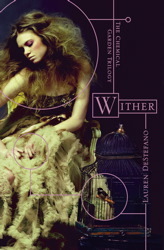 Wither is the first in DeStefano’s The Chemical Garden Trilogy and I so can’t wait for the next book to come out. Take a peek inside Wither and see how awesome it is. So, every once in a while I’ll blog here about writing or even post a snippet of my stuff. Well, not anymore. No, I’m still a writer, but I decided since I’m on the verge of querying my first book that it was high time I had a different blog that was all about me, the writer. So this blog shall be all about me, the reader. The two may overlap from time to time but for the post part I’ll be keeping them separate. For review from author via publisher. I am so not a fan of gardening. Everybody told me that would all change once I owned my own house. Yeah, not so much. Thankfully my massive 7 acre yard came with ready-made flower gardens, rose bushes, trees and lilac bushes, cuz God knows I had no desire to plant gardens. I also had no freaking idea HOW to plant a garden. So what the heck am I doing reviewing a gardening book, you may be asking. Well, when the opportunity arose I thought, “Why not? Maybe it’ll help me with my gardening issues.” And I’m so glad I did. Jodi and her book may just turn me into a gardener yet. 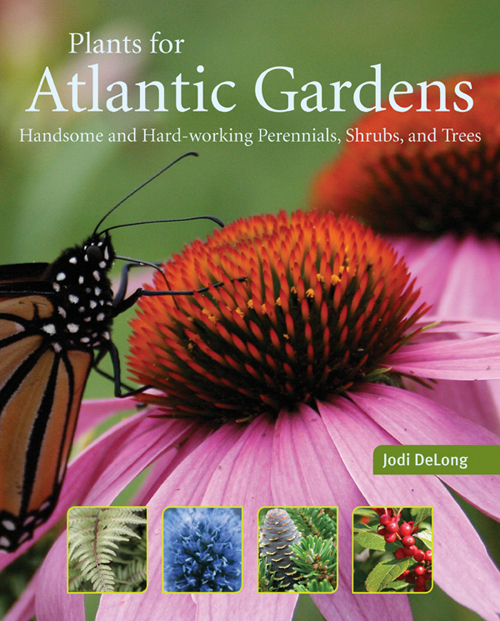 This book is a great resource for Atlantic gardeners of any level. Jodi doesn’t assume the reader is an expert, but she also doesn’t talk down to the reader, either. Rather than coming off as an expert herself (which she is), it’s kinda like having a really knowledgable friend helping you to figure out what to plant in your garden. It’s this conversational tone that really made me embrace Plants for Atlantic Gardens. I love how Jodi throws in little snippets of her own life and gardens into the book. There’s a lot of information in the pages of Plants for Atlantic Gardens – too much info for this chick to take in with just one reading. Thankfully the layout of the book is perfect for flipping through and browsing. This is the first gardening book where I haven’t felt over-whelemed while reading. Jodi explained things in a way that makes me feel like I can do – and enjoy – this gardening thing. The story follows Ty, who has lived his whole life on his family’s homestead and has dreams of claiming his own stake when he turns eighteen. But when outlaws’ attacks on government supply ships and settlements threaten to destroy the underwater territory, Ty finds himself in a fight to stop the outlaws and save the only home he has ever known. Joined by a girl from the Topside who has come subsea to look for her prospector brother, Ty ventures into the frontier’s rough underworld and begins to discover some dark secrets to Dark Life. What an amazing world Falls has created! It boggles my mind when I read a book like Dark Life that takes place in a completely different world than the one I live in. 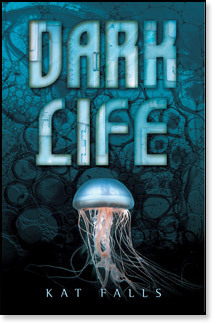 Sure, this is a post-apocalyptic dystopian, so technically it takes place in our world, but since most of it takes place underwater and includes pretty cool things like Liquigen (used to breath under water) and houses that look like jellyfish, I have plenty to be in awe of. This was an action-packed book that I think boys will love. Girls will love it, too, but I think the constant action and danger Ty faces will appeal to male readers. But, yeah, this female reader was completely taken with the story Falls weaves in Dark Life. Or rather, I should say stories. Because despite the non-stop action this book was heavy on plot. I was constantly taken by surprise at the twists and turns and just when I thought I knew what was going on, Falls would throw something at me that I totally didn’t see coming. Well, my bookish friends, I’m now shoving Dark Life at you.